I judged this book by its cover. You’re not supposed to, of course. That’s a lesson taught in grade one. But marketing exists for a reason. “I Am Legend,” to me, is one of the greatest titles in the English language. It sounds wrong to the ear, but the suspense engendered by its promise grips the reader from the very first page. And Richard Matheson, the book’s author, does not disappoint where that promise is concerned. 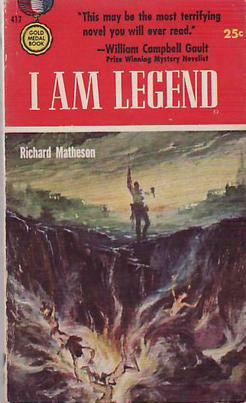 I Am Legend was published in 1954. Matheson was a horror and science fiction staple in the mid-twentieth century, sort of the ur-Stephen King, whom King himself has credited as a major influence. A writer for the Twilight Zone (he wrote the one with the monster on the wing) and the story that inspired Spielberg’s breakout film Duel (1971), the man knew how to build tension. So Legend, on the brink of novel and novella at 160 pages, reads quickly, even when its protagonist is the last living man on Earth. A plague has swept the world, and killed everyone. The real problem, however, is that the virus then reanimates its victims into creatures not unlike vampires. They have a thirst for blood and a sort of rudimentary intelligence and memories of their former lives. Robert Neville, the sole survivor, ekes out a dreary existence in his fortified house, spending his days sharpening stakes and driving to hotels and suburban houses to impale the undead that linger in his town. At night, he listens to records and tries to ignore the sounds of the creatures calling his name, their violent break-in attempts, and the temptations of the pale women that pose for him outside his window. The book is a marvel of concise storytelling. Matheson keeps the reader in Neville’s head the entire time, following him on his daily routine. It is a portrait of loneliness without maudlin conceits. Neville lost his wife during the plague, and his reminiscence about the incident ends just as he opens the door to find her again. Matheson does not describe what Neville had to do, and the book goes on. But the reader is left to imagine that seed of despair. When Neville finds a dog, a live, healthy dog, his manic attempts to capture it become an all-consuming obsession, the reader included in that mania. You want him to rescue the dog for God’s sake. But shortly thereafter he also finds a woman walking around in the daytime. And his world is changed. The woman, Ruth, reveals the true nature of Neville’s victims, and stirs in him a final revelation that concedes all hope. I Am Legend has been adapted several times. 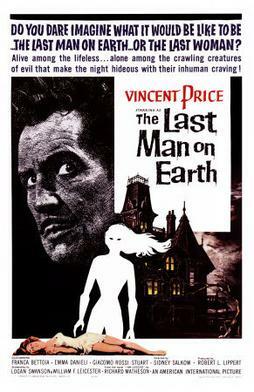 Ignoring The Asylum’s 2007 cashgrab (I Am Omega), it starred Vincent Price in 1964’s The Last Man on Earth, Charlton Heston in The Omega Man (1971) and Will Smith in I Am Legend (2007). The Vincent Price film is the most faithful version, which follows Price as Neville going through much of the same plot beats as the novella. Unfortunately, the film’s first half is marred by an overbearing voice over. Price’s weary motions, his daily routine, his growing despair, are all presented capably by his body language, but listening to him narrate it step by step becomes tiresome, robbing the film of much of its suspense. There is one untouched scene however that has Price watching a home reel of his daughter’s birthday. An incident at the party has him laughing on the couch, only for the joy to transform gradually to tears. It is a moment that the usually melodramatic Price turns into an honest heartbreak. The end of the film, while true in spirit to the novella, is a badly staged chase concluded with an unnecessary final speech by Price. Like many low budget schlock films of the ‘50s and ‘60s, The Last Man on Earth sort of just finishes its piece and fades out with an instrumental doom and gloom. Smith sells the loneliness and outright craziness that results from living in a world without other people to talk to (people that aren’t mannequins). For some reason, probably the spate of zombie films we’re about a decade into enduring, 2007’s I Am Legend turned its creatures into rabid CG boogiemen instead of vampires. They never look very convincing and the moral of the story, or at the very least the significance of its title, is completely overlooked by the theatrical cut. For those interested and for fans of the novella, I encourage you to look for the “original ending” clip that can be found on various tube sites. For some reason, probably having to do with the New Testament we’re 2,000 years into cribbing (see The Matrix Revolutions and Superman Returns), Hollywood loves to have its heroes sacrifice themselves, even out of context. I don’t deny it’s a powerful device, but everything in its proper place. I Am Legend is a story we’ll likely see again, and the original is sure to endure. As a wee lad I was gaga for vampires, and Matheson’s novella helped me clear that Anne Rice hump and move on to other sorts of fiction. Matheson bridges the gap between fantasy and sci-fi in Legend and leaves the reader with one hell of a last sentence. What the author provides is a place in Neville’s mind, a constant stream of narration and pain, a humanity that good weird fiction is all about. There must be an emotional core for readers to believe the fictional trappings, and Matheson’s writing leaves the pulse pounding and the senses frantic. What’s more, the loss feels real. This is why it will always upstage its adaptations, that cannot inhabit that personal space but must settle for spectacle. Or zombies. I remember “I Am Legend” (2007) coming out alongside Smith’s “Oscar” movie “Pursuit of Happyness” and I felt nothing for the man and his son, but the man and his dog… that left me as an emotional wreck. Yeah, I could have written an entire review about the emotional trauma that dog put me through. An excellent examination of Matheson’s highly influential novel, which was the acknowledged inspiration for NIGHT OF THE LIVING DEAD, and a very fair assessment of the first and (so far) last film versions. One reason why THE LAST MAN ON EARTH is the most faithful adaptation is that Matheson wrote the original script, although after it was revised by another scenarist, he substituted his “Logan Swanson” pseudonym on the screenwriting credit. All of this happened after the British censor forced Hammer Films to abandon their plans to film it as NIGHT CREATURES, again with a Matheson script. For further information about all three versions, as well as the unfilmed Hammer one, see my book RICHARD MATHESON ON SCREEN (http://www.mcfarlandpub.com/book-2.php?id=978-0-7864-4216-4). Bradleyonfilm- thanks for the kudos! Especially coming from someone who wrote the book on Matheson – literally.